A fair crack of the whip? Solomon Northup raises the whip and his stoic mask dissolves. The slave woman, Patsey shakes, body tied to the whipping post. Epps, the plantation owner, gives the order. The whip cracks, the girl shudders. The slave owner, his wife and their slaves watch. It cracks again, and again, and again. Epps holds a gun to Solomon’s head. Now when the whip cracks its snap is muffled by tearing flesh, and screams rip the air. Later, when the slave women wash her, Patsey’s back is hardly recognisable – flesh is flayed into ragged strips. Of the many brutalities depicted in the film 12 Years a Slave, the scenes of flogging testify perhaps most of all to the horrors of corporeal punishment. In his 2011 book In Defense of Flogging, American criminologist Peter Moskos proposes offering a choice to those about to be incarcerated: serve your sentence, or receive a flogging. He argues that given both the deeply ingrained human desire to punish and the terrible suffering that occurs in prisons, almost any punishment is preferable to incarceration. Unlike Jonathan Swift in A Modest Proposal, Moskos is not engaged in satire. As this article in The Washington Monthly makes clear, he is serious: he believes flogging to be preferable to the present system of imprisonment. With the highest incarceration rate in the world, Moskos’s native United States is the explicit target for his proposal but last November he presented his thesis at the Festival of Dangerous Ideas at the Opera House in Sydney. A show of hands at the end of his talk said that many had been converted. Moskos was sympathetic to ideas around restorative justice and the good work of psychologists and others working to rehabilitate prisoners, but argued that there was simply no public will – and thus no political will – behind large-scale prison reform. People wanted punishment too much, he said, and so other acts were necessary. Flogging was his preference – he even proposed importing floggers from Singapore so that locals didn’t need to get their hands dirty. It was a strange thing to propose to a lecture theatre of Australians, and stranger still to see so many accept the argument. Our early colonial history is, of course, irreparably scarred by the lash. 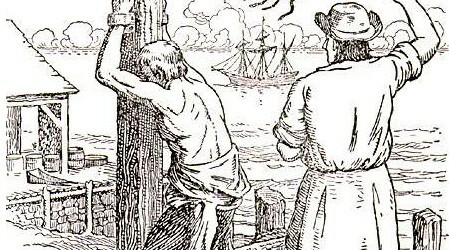 As Robert Hughes so movingly showed in The Fatal Shore, whipping was the most hated and feared of convict punishments. Colonial floggings were barbaric affairs. The infamous cat o’ nine tails was braided, knotted, and sometimes even woven with glass or metal to inflict maximum damage on bare flesh. Many victims suffered debilitating injuries, wounds often became infected, and deaths were common. While caning remained a punitive ritual in many schools until recently and occasional floggings were ordered until the middle of the last century, few look back to the days of the lash with nostalgia. Prisons are, of course, horrific places, rife with abuse and plagued by suffering. They foster mental health issues of many kinds, not least among them lasting trauma. They are also places where economic and racial inequality is even more pronounced: one-in-three black males born in the United States today can expect to spend time behind bars and the incarceration rates for Indigenous Australians are 12 times those of the rest of the population. Prison ruins lives, families and communities. It is no solution to the problem of crime, nor does it often seem fit punishment. This is what makes Moskos’s proposal seductive. Wouldn’t it save a lot of time, money and suffering to simply inflict punishment and allow everyone to move on? Recently, the ABC reported accusations of abuse of asylum seekers by Navy personnel. Whether or not the abuse took place is uncertain and may not be known – neither the Coalition nor Labor have called for an investigation (quite the contrary), and media organisations may not wish to risk further accusations of being un-Australian. It might seem a long bow to draw, from floggings to accusations of military abuse, but the history of incorporating violence into institutions is a tragic one. Violence – sanctioned or otherwise – always spirals out of control. Torture approved by the Bush Administration for use on specific high-value prisoners –the so-called ‘enhanced interrogation techniques’ ­– rapidly infected the military system. Once the capacity to harm others enters the system, it is almost always impossible to contain and the end result is too often much like that depicted in the infamous photos from Abu Ghraib. Here in Australia, Aboriginal deaths in custody have actually risen in the two decades since the Royal Commission. A steady stream of reports regarding inhumane living conditions in detention centres and ‘harmful’ medical care standards suggests that, even if abuse is endemic, Australia’s immigration system is at least callous and at worst cruel. It is a system designed to dissuade and deter others – and to punish those within it. Of course, no one in the Australian mainstream is actually arguing for flogging, or any other kind of corporeal punishment. For all that his proposal is serious, Peter Moskos is likely as interested in shocking the public conversation about justice and punishment into new directions. There is no evidence to suggest that corporeal punishment is an intentional component of the immigration detention system. Yet all around us is a casual cruelty, a disregard for the body of the other –whether someone desperate enough to pay a people smuggler, or to sew their lips together in protest at the conditions in which they are detained. Everywhere in Steve McQueen’s film are the abject bodies of black slaves. All too often they are naked, scarred, cut, even strung up in trees. Solomon raises the whip because he must; the slave owner Epps because he can. At the end of 12 Years a Slave, he is an impotent, broken man. His cruelty has undone him. Best we not raise the whip at all. Dr Michael Richardson teaches writing, literature and media, and researches trauma, torture, political violence, and surveillance. A former speechwriter, he also writes political commentary and book reviews, and is completing his first novel. He tweets at @richardson_m_a. Thanks, Philip, for the thoughtful comment. In Kafka’s story, violent punishment ultimately demands the blood of the jailer and the visitor to the colony is so disgusted at what he sees that he wants to escape the island as swiftly as possible. The cycle of brutality, quenched for a time, will no doubt begin again. This is, I think, always the danger when violation of the body enters the bureaucratic world. The thing that disturbs me the most about Moskos’s proposal is that by comparing imprisonment and corporeal punishment, and finding the latter preferable, he assumes that society’s aim is purely to punish. The intent of our prison system, at least in part, is to rehabilitate – a practice that dates back to 1779. Time in prison is intended to be a disincentive to commit crime, but it is also supposed to provide time for reflection and change. Granted, as Dr Richardson notes above, the real world impacts of imprisonment in the US and Australia are more likely to do permanent damage than to be a healthy place to rehabilitate. But this reality should motivate us to reform and improve the prison system, not to dismantle it in favour of something more brutish. Central Moskos’s argument is that prison is terrible at rehabilitation but there is no appetite to fix this. To my mind, throwing up our hands in this way just produces a race to the bottom. A similar approach across public policy would produce all manner of disasters.